Some hills get attention just because they are above a certain height. 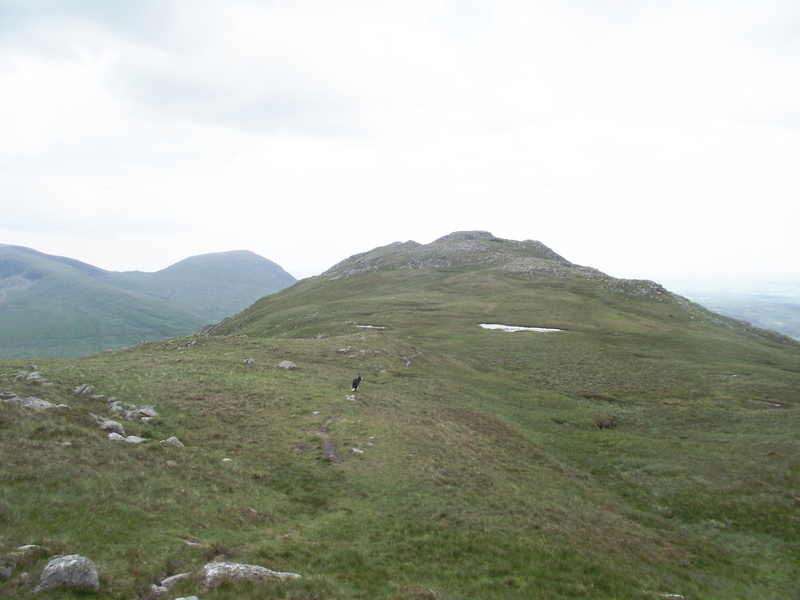 The Munros in Scotland (mountains over 3000 ft in height) started the trend in the UK, and the Welsh and English Munros, although fewer in number, are equally popular with British walkers and mountaineers. 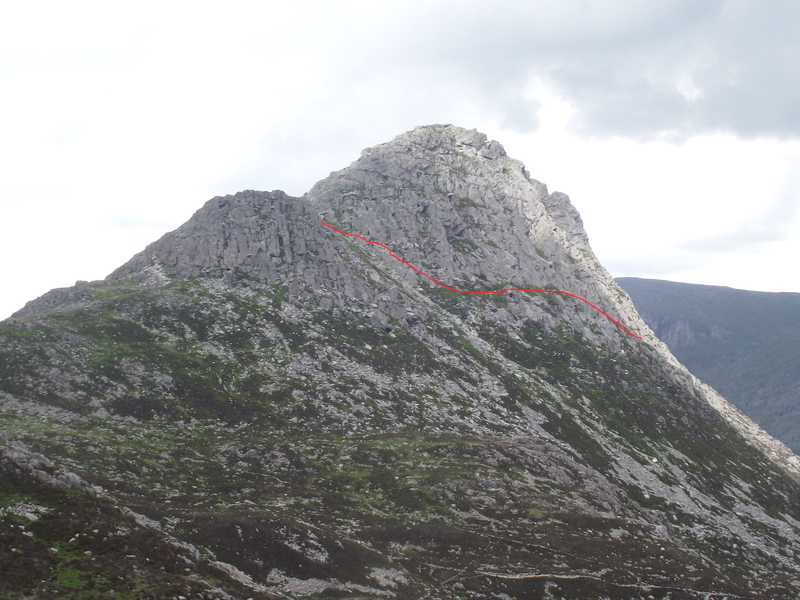 Tryfan at 3010 ft (917 metres) is the lowest of the Welsh Munros, and almost slipped off the Munro scale when the previous survey came out at 3002 ft (915 metres). 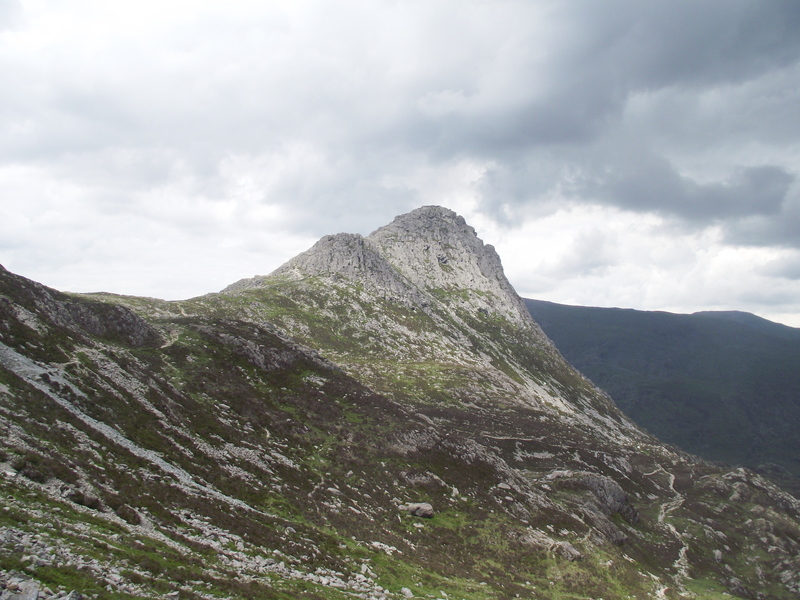 For many though, it wouldn’t have mattered much if Tryfan had lost Munro status. One look from below tells its own story – this is a mountain with class! 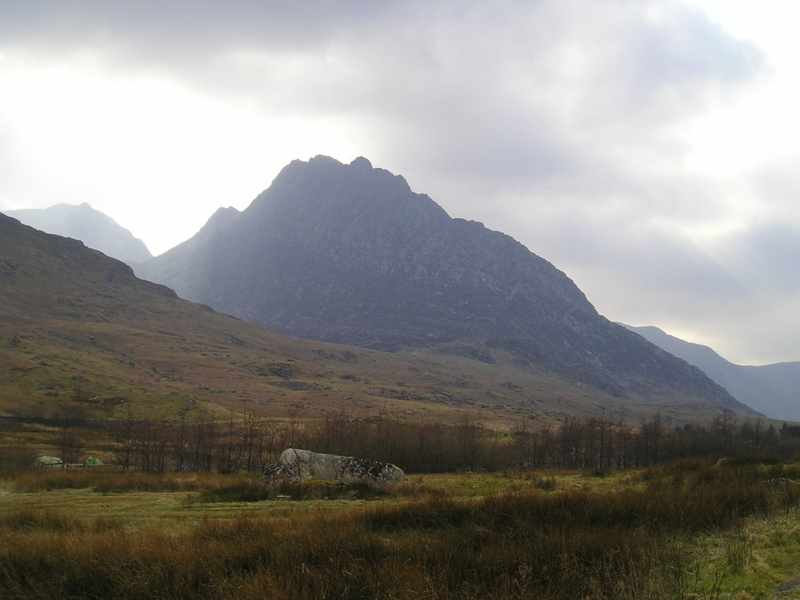 Tryfan means ‘Three Peaks’. The main peak is crowned by two large blocks named Adam and Eve, which are three metres high and just over a metre apart. 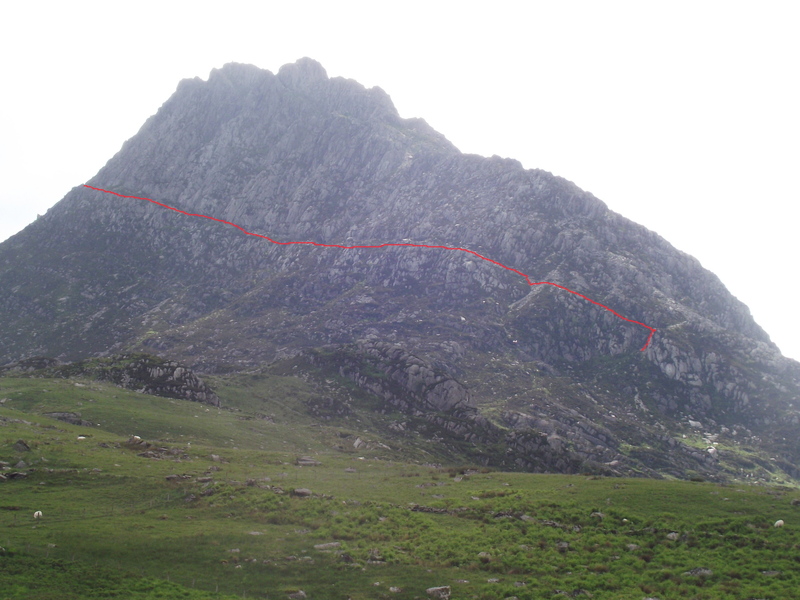 Leaping from one to the other is said to confer ‘The Freedom of Tryfan’ to those who survive! An otherwise simple step is made more ‘interesting’ by an almost sheer drop on the east side of the mountain. 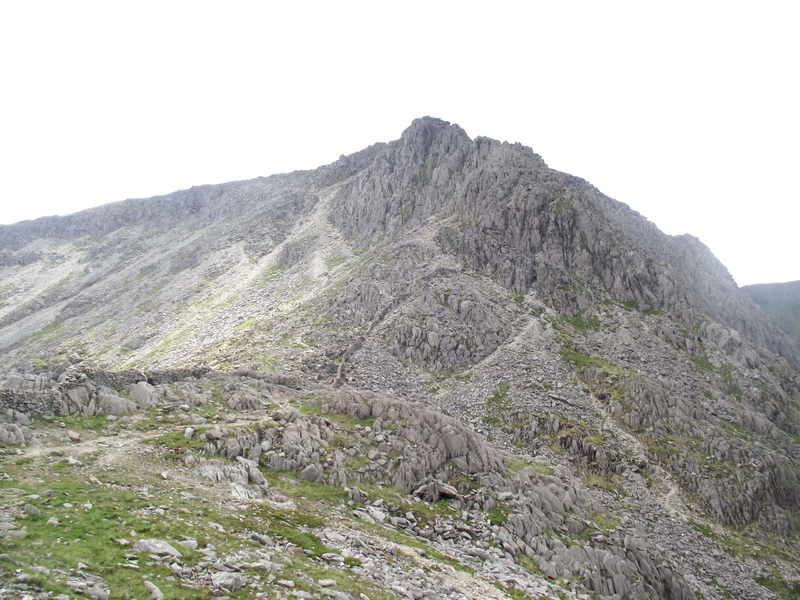 The most popular route for walkers (and the most difficult) is the North Ridge, a fine day out and a Grade 1 Scramble route. I’ve gone this way several times before, though it’s a joke shared by those using the route that you probably never go the same way twice, such is the variable nature of the ridge. 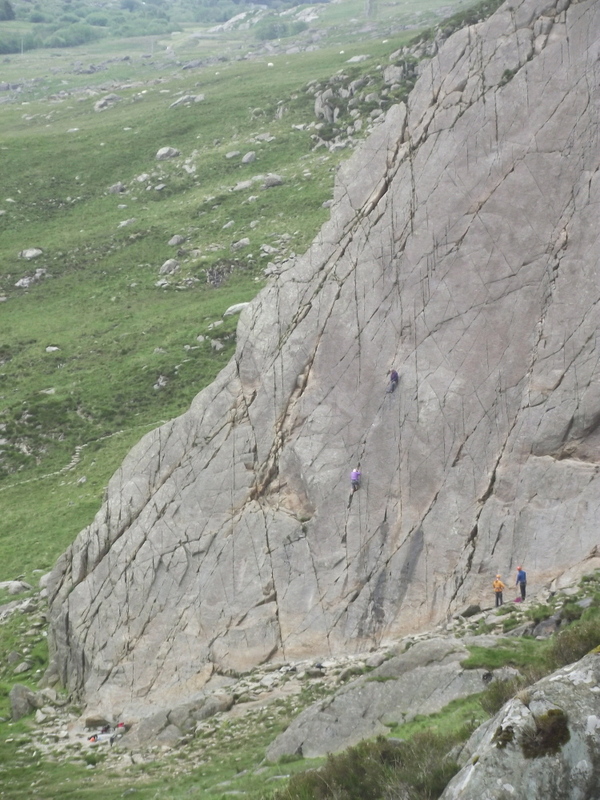 For a complete change, my route this time was ‘Heather Terrace’, a ledge traversing across the East Face of Tryfan. 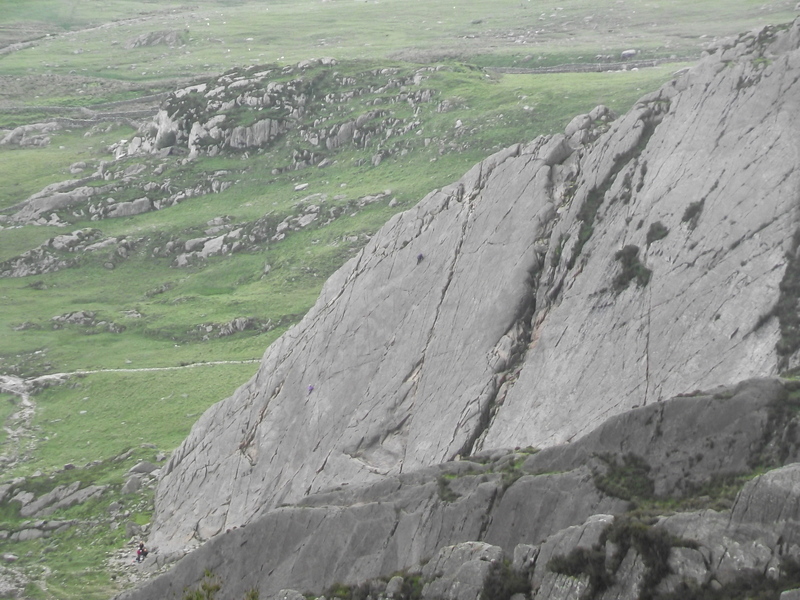 My route took me past the small climber’s crag of ‘Tryfan Bach’. The last time I had been on the crag was many years earlier, when I went down instead of up, guiding a rescue stretcher on a training session with the RAF. 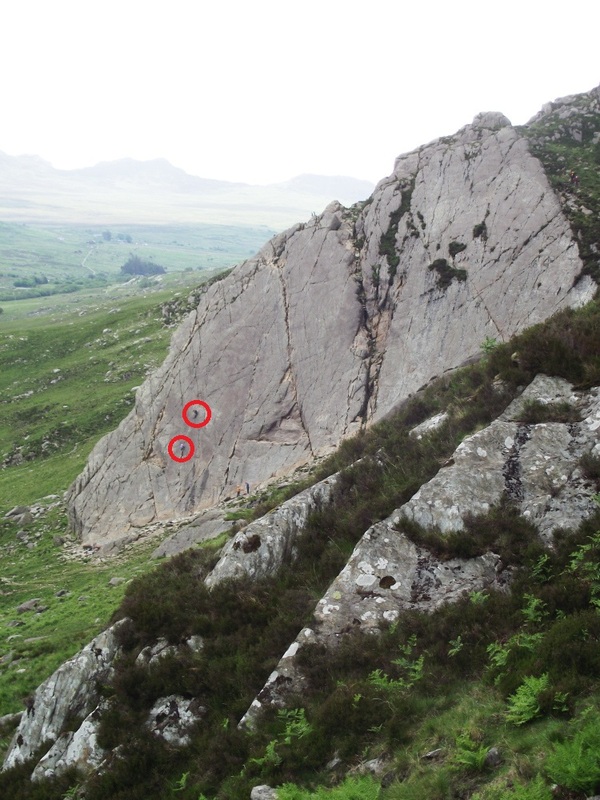 As I passed today, two climbers were making rapid progress on one of the easier climbs, but I was more interested in picking the best line to ‘Heather Terrace’. I wasn’t alone today – Border Collie ‘Mist’ was also along for a high mountain day. 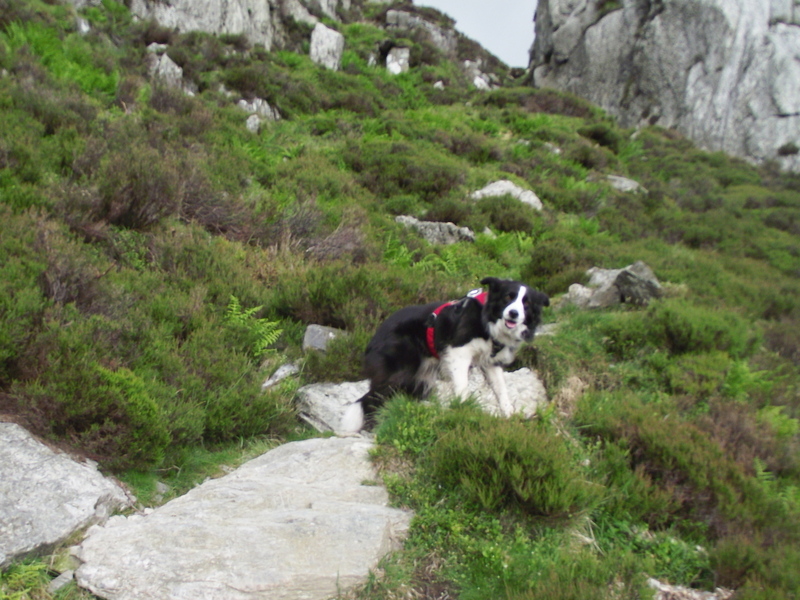 I have to confess that I’m not as blasé as I used to be about taking a dog on potentially serious mountain terrain – 25 years ago my Mountain Rescue dog ‘Matt’ would go anywhere that I did, but although ‘Mist’ is used to long mountain days, I had never taken her on a route with big drops below! Time to use the ‘Web Master Harness’ featured in post #56. The harness is a great piece of kit – it fastens securely to the dog and has a hauling loop and a ‘grab handle’ if things get serious. With the harness, the dog can be roped or lifted over difficult sections or obstacles. 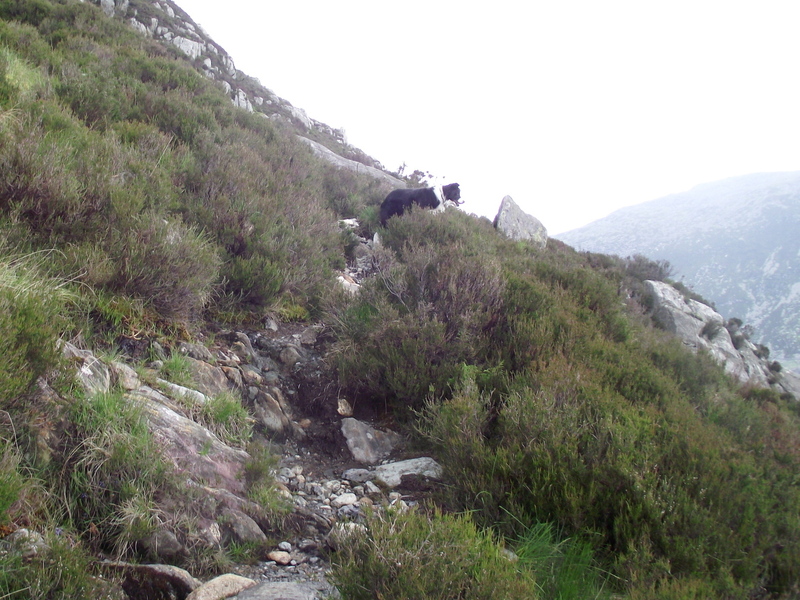 Although ‘Heather Terrace’ is technically easy, the route passes through steep ground and crags and I wanted to be able to keep the dog under close control if necessary. Of course, I needn’t have bothered – Border collies are quite capable of sorting themselves out, and ‘Mist’ had a great time, and by acting the ‘cute doggie’ she almost managed to beg sandwiches from a group we met on the route. 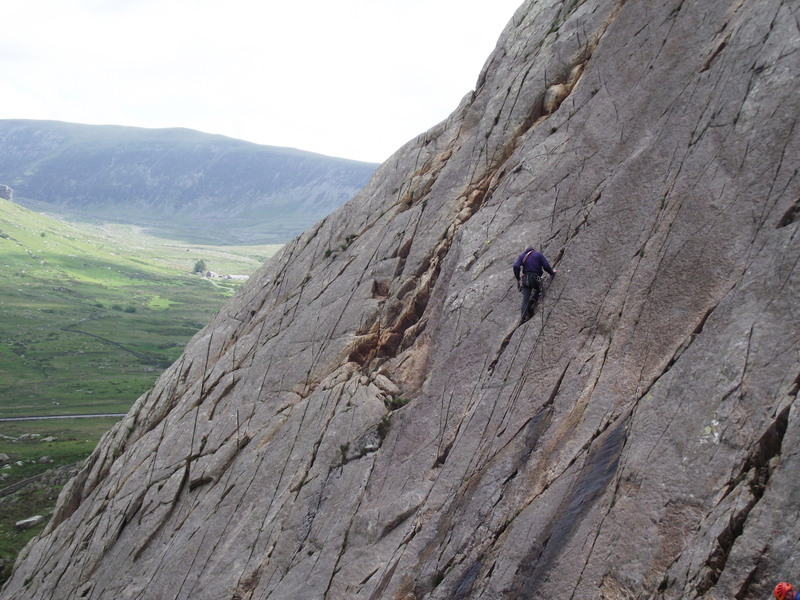 In pretty quick time we had finished the terrace route, and were heading down to the easy pass of ‘Bwlch Tryfan’, with the impressive scramble route of ‘Bristly Ridge’ beyond. However, a Grade 1 Scramble isn’t really the place for a dog, not even a Border Collie, so we settled for lunch instead before heading back. 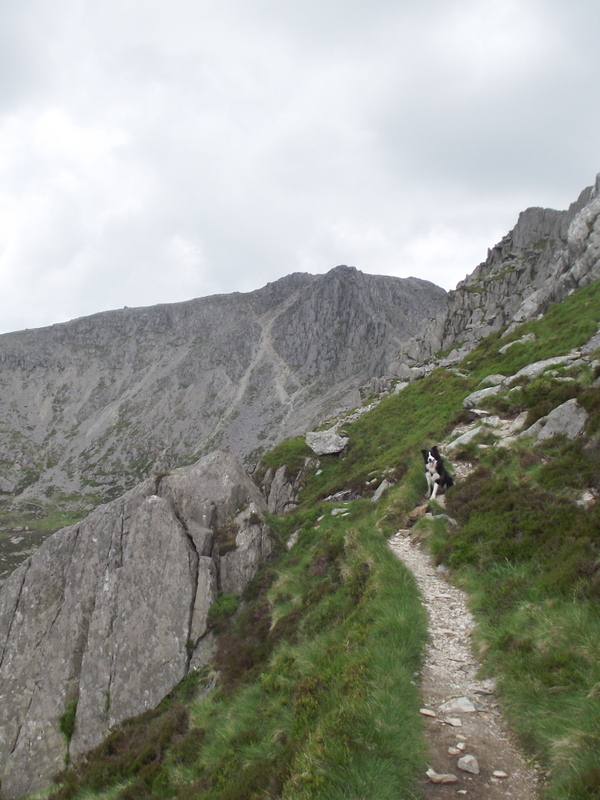 The way back was not straight down to Ogwen – instead we took the Miners track then headed for Y Foel Goch, a route we had followed last year with friends John and Mavis (post #47). 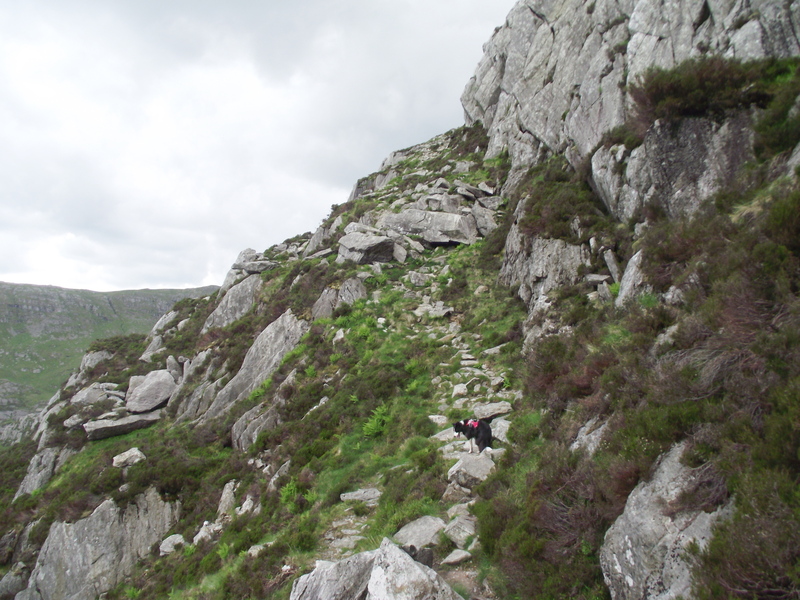 From there, the route followed new ground for me, with an interesting descent of the Gallt yr Ogof ridge. Gallt yr Ogof isn’t a knife-edge epic, but it needs full concentration on route finding towards the end, where the ridge plunges over crags to the valley floor. No plunging for this man and his dog though, and before long we were back in the valley, enjoying views of Tryfan on the way back to the car. This entry was posted in 5. 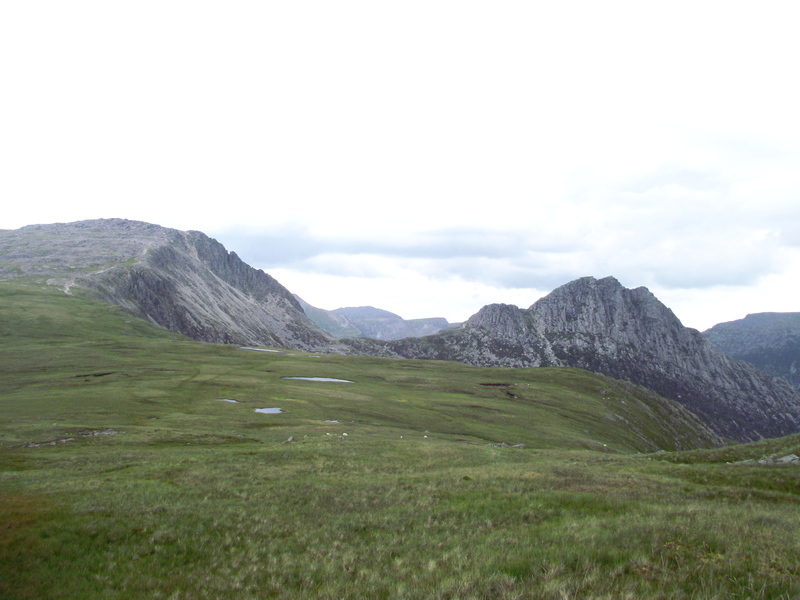 North Wales and tagged hillwalking, mountains, photography, Snowdonia, Tryfan. Bookmark the permalink. Thanks SP – the day was a welcome break from sorting out the house. Mist looks right at home up there. Nice post. Thanks for that, Craig – she’s a constant companion in the hills, and never complains whatever the weather! Paul, looks like Mist did pretty well. 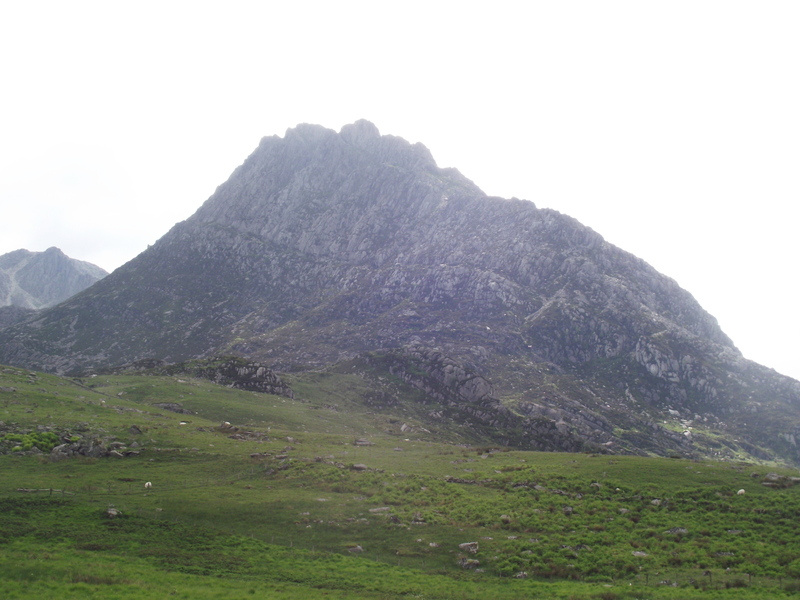 I must say that I have never climbed Tryfan ! It’s rougher walks like that when you really need a dog that doesn’t have to be on the lead and I’m afraid my lovely Dixie doesn’t fit into that category. Doesn’t like other dogs, doesn’t like small children, too fond of sheep…….love her to bits mind, but she would have to be left at home on that route! I hasten to add that not all Boxers are like Dixie – our family have always had the breed and she’s the first one that’s had so many hang-ups! 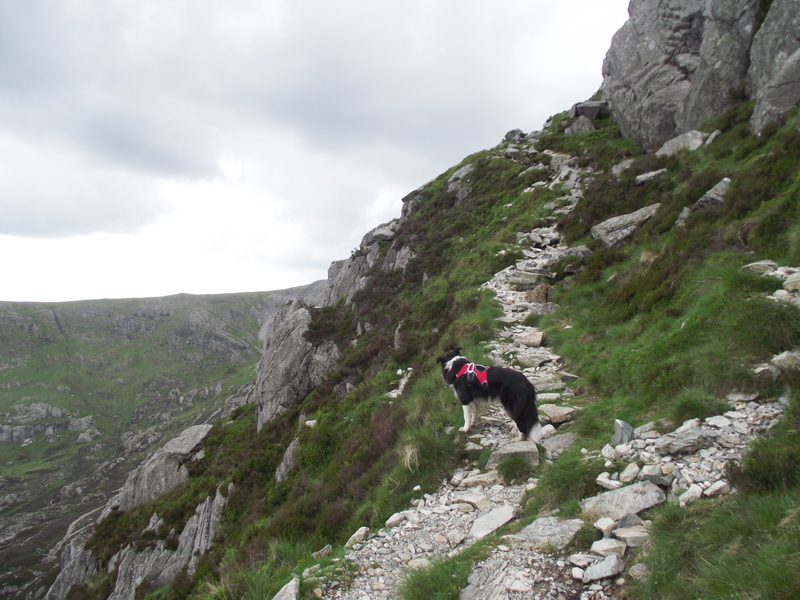 Just made me think, I remember Geoff taking his previous dog – a Border Collie – over Bristly Ridge and making her a harness out of a sling to get her over some bits of it. And, two Boxers ago, we once climbed out of Tilberthwaite Gill up some steep side above a waterfall and ended up making a sling harness again and passing the dog from one to the other. I have to say that that Boxer – Benga she was called – was once of those absolutely perfect dogs that could even make a dog-hater want a dog. I used to climb when I had ‘Matt’, and as he was an obedient (!!) SARDA dog I would leave him at the bottom of the crag on a long ‘Stay’ – There would be a howl or two as I climbed, then all would go quiet – he was always there at the top waiting for me. How do they do it? 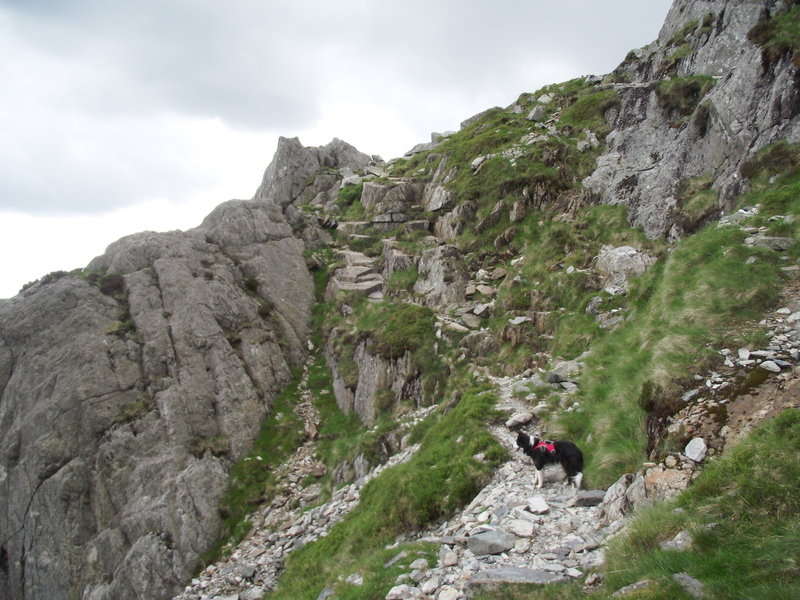 I took him on the Aonach Eagach, as I had my earlier collie, ‘Ben’. I don’t know if I would do that now with ‘Mist’, not that she couldn’t do it, more my sense of worry about her – like I say, I’m getting older! As a police officer I once dealt with the aftermath of a fatal accident on Helvellyn, where a dog went over a cornice, and the owner (a very experienced and respected mountaineer) did the instinctive thing and went to see if the dog was ok. He also fell through the cornice and was killed – the dog survived without injury. I’m much more cautious with ‘Mist’ than I was with my other dogs when I was younger. Hi Paul, some wonderful photographs. This reminds me of my D of E experience in North Wales. Fantastic memories of fell walking next to waterfalls. Have you ever been to the West Coast of Ireland? It’s beautiful! Hi Cheryl, and thanks for the comment. The West Coast of Ireland is amazingly beautiful, and Chris and I have done some walking there – wonderful! One of my favourite mountains, especially via the North Ridge. An excellent write up too. 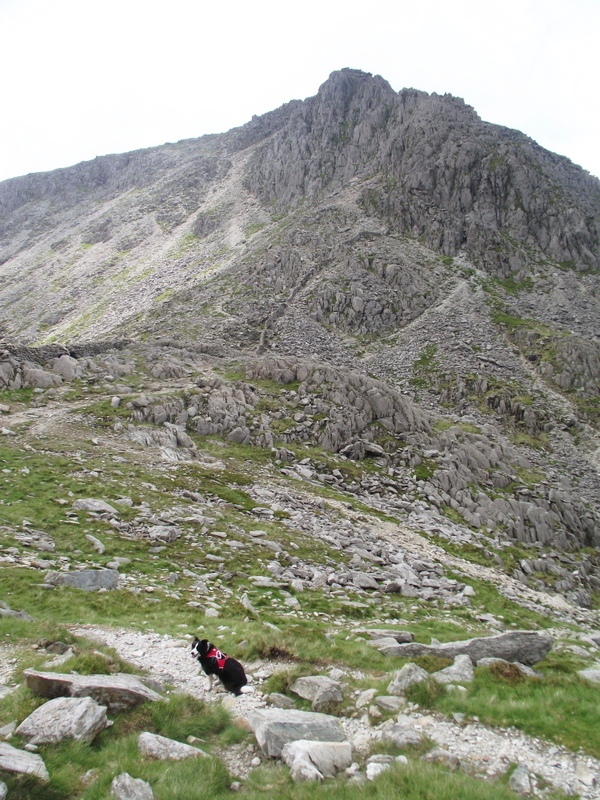 Many years ago I went round the Snowdon Horseshoe with a Ranger and his dog. The dog handled the terrain superbly, better than a walker who fell off the ridge and we had to back-track to look after him and his head injury until the helicopter arrived to lift him off. Thankfully he recovered. Thanks for the visit and the comment Andy. We’ve only returned to having a dog a couple of years ago, and I’m slowly regaining confidence in a dogs ability to cross difficult ground in the mountains – ‘Matt’ (my dog of 25 years ago mentioned in the post) never gave me a moments concern, and ‘Mist’ seems to be just as steady. 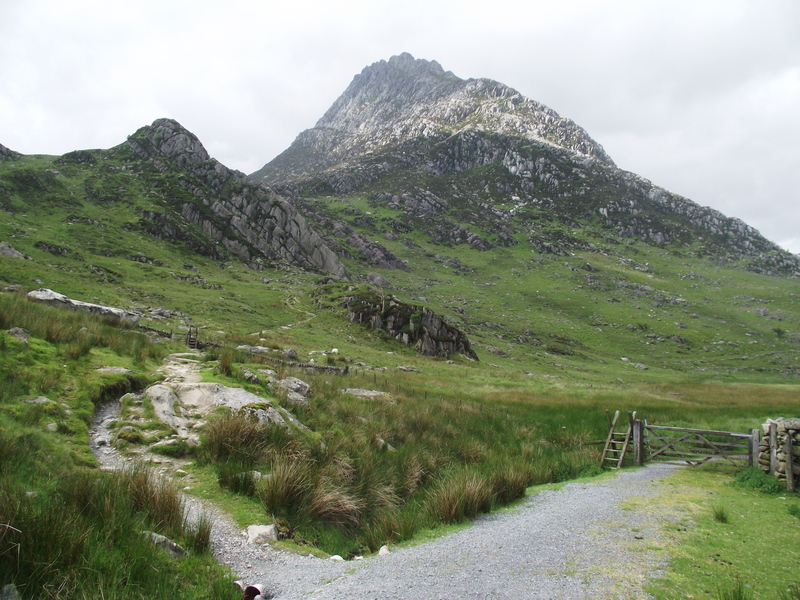 I have to put in a negative vote for Tryfan I’m afraid as I don’t like the hill at all. Having said that, I enjoyed your post and photos as I wasn’t able to follow Heather Terrace when I set off along it in thick mist – I found the start then just seemed to be faced with jumbles of slippery stones on any line I tried so I gave up and did the Miners Track (which I like) instead. 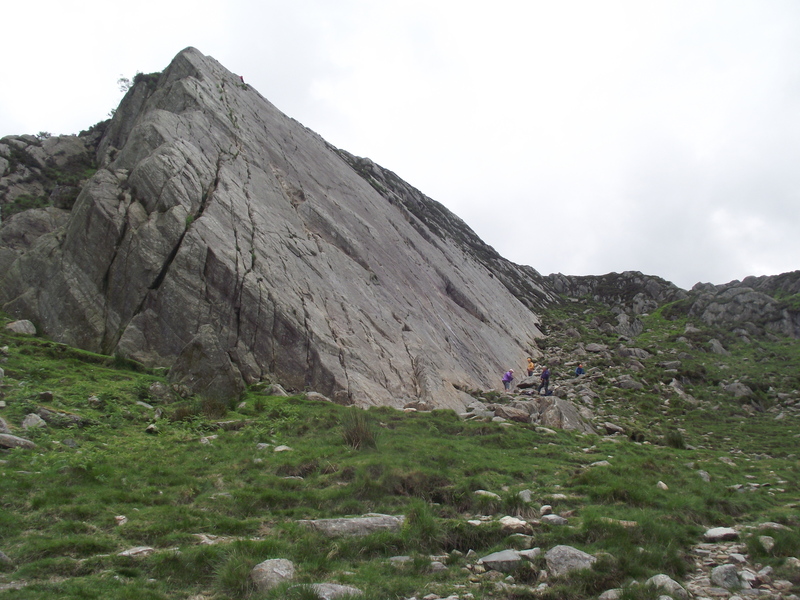 Having said I don’t have any fondness for Tryfan Fawr, I’d positively love to get to grips with some of the easy climbs on Tryfan Bach, especially that super-easy crack which runs up it and is so obvious on your photos! I’m not surprised you couldn’t find it in mist, Carol. There are a couple of misleading lines that soon resolve when you have a view – without that view you would struggle unless you knew the route. I’m not honestly… I was actually eyeing that easy crack line on the day I couldn’t find the terrace – and that was long before I started climbing! I found your website while reading “Death on Milestone Buttress” by mountaineer Showell Styles. It’s a murder mystery. Never thought I would ever be interested in mountain climbing but now I want to go to Wales and at least walk up the Heather Terrace! Wales is beautiful! So is your collie Mist. It must be great fun to take a dog with you up the mountain. Hi Cathie, and thanks for the comment. ‘Mist’ comes on all of my mountain trips, and the day wouldn’t be the same without her.